Hi, sorry Molly and I couldn't make the reunion last Sun. I wanted to update you on how she's doing. She's outside right now romping in the yard, chasing squirrels. I really believe she knows she is home for good because she hardly ever whines any more. She knows exactly where we're going on our walks, and goes upstairs to the bedroom when she doesn't want to go out, or just wants a time out. Usually she's following me around. She loves everyone she meets on our walks, especially the school crossing guard. They have a mutual love thing going on, and Molly just melts against her side, so I try to get home on time so that Molly can see her. Molly has that great Golden Retriever attitude, that everyone has been put on earth to love her and worship at her feet. On the rare occasion someone passes us by without stopping to fuss over her, she will stop dead in her tracks and stare after them, mouth agape, until I tell her it's OK. Turns out she is also afraid of flashlights and the dark as well as cameras. I'd love to know the story behind that one. If she sees me get the flashlight out to go on our morning walk, she runs upstairs to her safe place and just will not come down. I have adjusted my work schedule a bit to follow the daylight, so she can continue her morning walk. And on the rare occasion she decides she's done walking, she sits down and just plants herself on the sidewalk until I give up and take her home. She recently started scratching a lot so we went to the Vet. We're assuming it's a seasonal allergy and a steroid shot cleared it up for a few days. She started to scratch again, so I got some hydroxyzine and a special shampoo from the Vet. She's only needed a couple of pills so far, but the bath was a sight to see. She doesn't like those, either. What is it about water dogs that they don't like the tub? She hasn't tried to get into the fishpond, and I suspect she doesn't know she can. She doesn't seem to be really aware of the kittens, although they certainly are aware of her! Henry, who will be 1 tomorrow (I suspect there is some John Lennon in him), likes to sit behind her and swat at her constantly wagging tail. Rose, a very mature 14 months, is very curious about Molly. Sometimes she will climb on the coffee table and get as close as she can to Molly, very brave, then give her a good swat and run away. Molly doesn't even know, of course, that she just got smacked. The other day I caught them all nuzzling nose-to-nose, so there is hope. Molly sleeps on the floor beside my bed, I bet she wasn't allowed in bed before. Since Molly came home, the kittens have taken to sleeping in my bed with me. I think they are staking their claim to me. Molly loves going for a ride in the car, but just lies down on the back seat which is fine because I don't want her hanging out the windows anyway. Her hair is coming in nicely. The Vet noted that Molly has a white stripe developing down both sides of her body. We don't know yet if it's just her shading, but we are watching it because the Vet said long white stripes can mean hypothyroidism. If they are evident when her hair grows in, I'll get her tested. A Golden with a thyroid problem, imagine that! Molly just went upstairs to get a toy and Henry is pretending he has to run away from her, so it is often like a circus around here. Rosie is sitting next to the computer, taking this all in. And I get to laugh a lot. Thanks for the Molly update. We�d love to see a picture of Molly with her kittens! Molly is starting to settle in. See attached picture. My husband was quite smitten by Nash, so maybe we�ll see you again in the near future. Molly looks like she�s made herself right at home! Thank you so much for adopting one of our seniors! On behalf of Bear, Atlas, and our family, we would just like to say what a wonderful time we all had at the Fiesta in October. The volunteers worked so hard at putting it all together and every detail was delightfully planned - including the pictures, food, goody bags, treats, raffle, games, and of course, the Parade of Rescues in which Bear was an honored participant. The lovely booklets featuring each of the dogs� stories are a beautiful keepsake of the great day. Thanks again for inviting us, and for the hard work on the part of the GRRI volunteers. Thank you so much for your kind words. We agree�it was a fun day and a most gratifying one when we see all our wonderful rescue Goldens so happy with their forever families. See you next year! It is with tremendous sadness that I am writing to tell you that we had to help our sweet boy, Velcro Rusty, to the bridge yesterday. He had been diagnosed with bone cancer in early Sept and we were fortunate to have another 2 months with him. Every day with him was a gift!! We adopted him when he was 10 yrs old. Rusty would have been 15 yrs old in a few weeks. We'd had a difficult week as he became weaker, the tumor was rapidly growing and the pain meds were not helping as much. It became evident that our time was drawing short - we were able to have a family gathering to say our good-byes, including 4 yr old granddaughter, Abbey. We went outside last night and found the brightest star in the sky & Abbey decided that was Rusty because it looked blue to her & he wore a blue collar. He was loved very much and we all miss him very much!! We Thank GRRI for allowing us to love & care for such a sweet old soul. Robin and Brad, our sincere condolences on your loss. You�re right, every day is a gift to be cherished with these wonderful animals. Thank you for adopting one of our senior Goldens. There�s nothing like Old Gold. Just wanted to thank you for everything and tell you Buddy is doing well and seems to have adapted quickly to his new surroundings. He is definitely keeping us busy tossing the ball to him and running around the yard. He passed the thunderstorm test last night without a whine or peep. I also picked up a gentle leash and it's like walking a different dog. Thanks for the update. It sounds like everybody is getting a lot of exercise! On Saturday, we had to help our beloved Bandit to the Bridge. As some of you know, Bandit was diagnosed with hemangiosarcoma back in March. With the help of chemo and lot of TLC, we managed to keep him for 8 more wonderful months. However, when the end came, it came so much more quickly than predicted, we were left stunned and shattered. Devastation doesn't come close to describing our feelings right now. Bandit was our heart dog. He was only 9. Please say a prayer for our sweet boy, and give your furkids an extra hug tonight. Anne and Rich, we were so sorry to hear about Bandit�s passing. We know, though, that Marcus was waiting for him at the bridge and the two of them are now running around having a wonderful time up in heaven. I have slowed down quite a bit this past year. I take all kinds of nutriceuticals and special foods for my sore joints, thyroid medication, and steroids to alleviate the neuropathy affecting my back legs. I'm sorry I missed the reunion this year � I had so much fun seeing everyone last year! It seems my parents went and moved to Saratoga Springs. I really don't care for long car rides any more, but it wasn't that terrible. Our new home is wonderful - No stairs! Everything is on one floor � I love it! This is the best town for dogs. Everybody stops and wants to pet me! It seems everyone either has or misses their golden retriever! Stores put water bowls outside so I can always get a drink; restaurants will let me sit outside at the table with my family as they eat. Many stores will even let me come inside! Best yet, there's this beautiful park right in the middle of town that is so much fun to walk around. I make my parents bring me every day! (Picture enclosed.) I walk so much more than I did back in NJ. I wish we had come to this place years ago. I feel better and am more active than I've been for quite some time. I love this place! Here it gets colder than in NJ, sooner too. My family went and got me a fleece-lined coat. I thought it was a bit lame until I realized I didn't get so wet or cold. It's OK. I am enclosing a picture of me in it. The veterinarian is right on the corner (how cool is that?). They do a fund-raiser for animals on Halloween. They made these cut-outs for children to take their picture. My Dad decided to take mine! Best wishes to everybody for a Happy Holiday! Kip, thanks for writing. You look absolutely smashing in your winter coat. Your family really loves you and wants to make sure you stay nice and toasty warm! It is with a broken heart that I must tell you that my sweet Amber girl was helped to the Rainbow Bridge tonight. Amber came to us as a foster and she was here to stay the minute she came into our home. Amber was our healing dog who taught us that we could love another dog again. She was gentle, kind, regal and so sweet spirited. Amber was diagnosed in August with Hemangio on her spleen (it was malignant) and was not given much time. She surpassed her time with us and became known as the miracle dog; but unfortunately she started to decline last Tuesday. We felt we owed her this last gift after she had given us so much and she went with dignity. We will miss our beautiful girl so much, it hurts so bad right now. Thank you to everyone who has given me their support these last few months, it was truly appreciated! I have attached a short video celebrating her life with us, if you have speakers there is music to go along with the clip. She would have been 15 years old on January 3rd; we had her 8 wonderful years and we were truly blessed. Godspeed sweet girl, I will always LOVE YOU!! Pat & Joe, our deepest condolences on Amber�s passing. 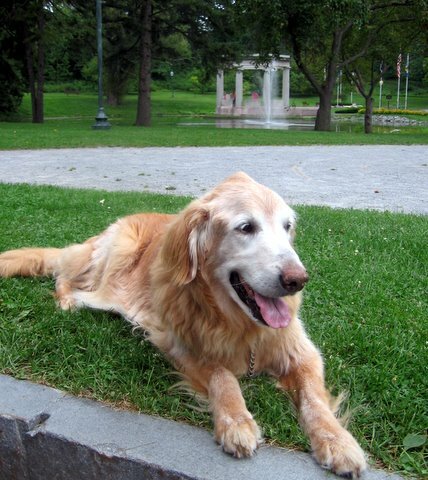 All of us who have known the love of a senior golden understand your grief. Our time together is much too short, but the love shared known is timeless. Wow, its been a week already? I can't believe it. We've had so much fun and Woody (changed his name on account of the confusion with Jessy) and I thought it is fitting although backwards from Arlo Guthrie to Woody Guthrie. He has been welcomed by all the neighbors and he gets so much attention from the kids, he loves it. Even when running errands last Thursday I stopped in to get my hair cut and I told my barber all about Woody. She said you have to bring him in. Well I went home, picked him up and took him back to my barber and they all just melted, you would think he was a movie star. He is an amazing dog. We play fetch every morning and evening. I changed to tennis balls because he was losing the Kong ball in the dark. I don't let him have them for very long though, after he runs out of gas he likes to pull at the fuzz, so that signals we're done playing fetch. We also walk a mile in the morning and night. We're both ready for bed at night. We spent all of yesterday and today outside, Woody is getting the hang of the invisible fence, sort of. I will forward more pictures in a couple of days. Time sure does fly when you�re having fun, doesn�t it? We�re thrilled that you guys are doing some male bonding! Here is a picture of my darling girl GRRI Chloe on her 6th birthday. The black and white dog in the background is her BFF Abe a St. Bernard/Boxer mix we adopted down here. Chloe says thanks to GRRI for rescuing her. 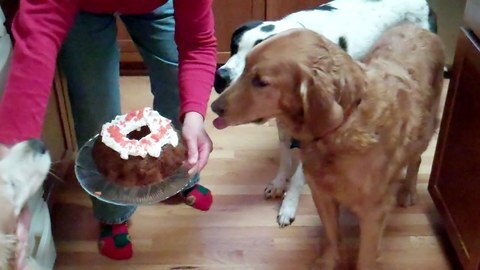 Happy Birthday Chloe and all the other �Dolly puppies�. It�s so hard to believe you�re all 6-years-old already! It has taken us a while to contact letting you know that our wonderful, sweet Zack, had passed away over the Labor Day weekend. We adopted him through your Rescue and he brought us tremendous love and joy; never, never was there a sweeter companion. He "never" barked and was velcroed to my side during every walk we would take. We picked him up in Hawthorne, NJ through his very nice foster, Mary Jane Roethlin in October, 2005 (this was after the passing of our other Golden, Bear). Our Zack lived to be 9 yrs. old and died quite suddenly, due to a tumor around his heart. Truly, he became ill in the morning and was gone by 4pm, out of Red Bank Veterinary Hospital. The suddenness of his passing has left us quite devastated, as you can imagine. Sorry for the rambling, BUT we have begun the process to look for another rescue and are so in love with the Golden Retriever breed. I am a bit nervous due to the fact that we lost two within 5 years to cancer, so I have been searching for Golden Mixes. I would certainly consider rescuing another Golden from your Rescue; we live in Cape May, NJ and have already been interviewed back in '05 prior to adopting our Zack. We would really like a 1-2 yr. old, gender no issue. We also, as in the past, have two cats, ages 6 yrs. & 6 mos. We have a single home 5 minutes from the ocean, woods to our backyard, and have an Invisible Fence. I am a stay at home mom, two sons in college, and a wonderful husband, who is set to retire sometime next year. make our family complete again. 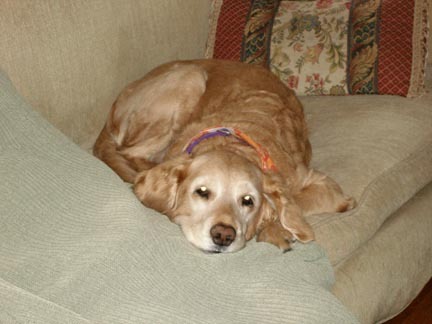 Zack was a wonderful golden and one of Mary Jane�s favorite fosters. Our sincere condolences on his passing. I didn't realize you *really* wanted a photo, I thought you were asking just to be nice! OK, we'll get you one. We'll try using the timer on our camera but otherwise Christmas for sure. Molly has never once ventured into the tub. She really seems to like our king size Tempur-Pedic bed though! Every day she picks one of our slippers to keep her company up there. And she alternates between Tom and I. Guess she doesn't want to appear as playing favorites! P.S. - We absolutely adore her. She is such a lovely girl. And I can tell, Sophie is happy to have her around! She is eating well for us, we boil venison meatballs for her and add one to her dry food each meal and that does the trick. Tom takes her running, 3 miles most mornings. The other days I take her for a big walk before I leave for work. Tom told me that at first, she had trouble pacing herself and would poop out midway. But she is learning and is almost able to make it the whole way. So, she is doing really well with us. Barbara shouldn't worry about her at all. Yup�I REALLY did want a photo. I�m thrilled to hear how well she�s doing, and that she�s moved out of the bathtub into your comfy bed! It�s Lauren Walters. I adopted Coby who is my special little guy or shall I say big guy! He has brought such happiness into our lives. I know it has only been a little over a year but we feel like he�s been a part of our family forever! I look at him and just melt. His personality us huge and I know he is grateful for the life he now lives. I hope Cody is doing well (hope Matt kept him). Think of him often. Couldn�t believe the similarity with Max and Misty to Coby and Cody�unreal how you could leave two sweet goldens outside half their lives when all they want is your love and affection. Hope all is well! Hi Lauren, THANK YOU for bringing Coby out of the cold and into your wonderful home. 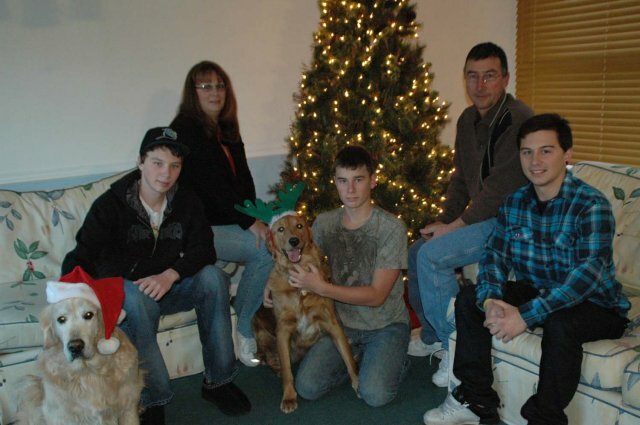 Yes, Matt did adopt Cody and he�s doing very well. We agree, we don�t understand how people can leave their pets outdoors either. Just wanted to share our family Christmas picture with you. I think Benjamin is quite happy here. Hope you have a happy holiday season. What a wonderful photo! Merry Christmas to you and your family. not a creature was stirring not even Brave Belle. while visions of rabbits danced in their heads. An oyster had opened and she is our pearl. Brought into her life for the company of another. Of the wind and the rain and the snow as it swirled. But the hard part was making that puppy behave. He snuggled up close and she just shook her head. Much like young siblings or a boy and his mother. When good pups are sleeping and children believe. 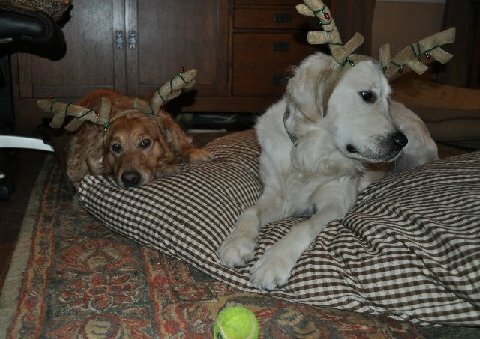 Just waiting for Santa and his reindeers a prancing. And Belle chose the role of the sweet timid mouse. Belle�s tail would wag � Oh company, that�s swell! But now greets strangers as if she�s a pro. From the greedy, despicable mill she�d braved. At first she thought it was noise in the street. Was that Santa she heard, do you suppose? And she hopped up to join Santa in the starry night climb. Pulling Santa�s toy sleigh on its� long winter flight. 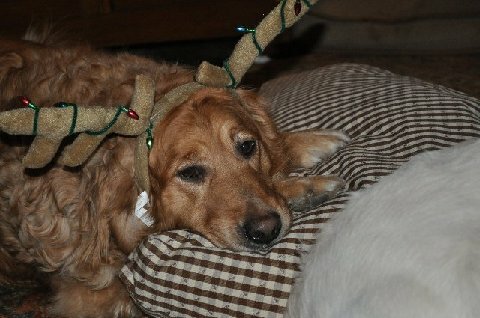 From her puppy mill hell to now pulling the sleigh. And Belle knew that she�d always been truly blessed. They loved her until she could start to heal. With a heart that�s bigger than the North and South Pole. Had accomplished pup rescues beyond compare. But when it was over they both wanted more. She hung her head low, her heart started to sink. She�d hoped that Santa would let Jack just stay. He needed his boy, he needed him back. And he was, by far, their very best flyer. Her boy, Mac, was so sweet and Oh! What a stud! At knowing that Jack had sent her that crazy boy. Jack told Belle to give Judy a hug � tight! And he flew off with Santa into the night. Finally all in the world was just right. Thoughts danced in her dreams of what was ahead. A dim memory that was fading at last. Knowing nothing of Belle�s little Christmas Eve flight. And now she lives happily with her brother, Mac. ~ For Judy and Jack and all of the magic that happens through rescue. Hugs, tight ones, from all of us � especially Belle. Another tissue alert�Nancy, we�re so grateful that you continue to shower Belle with the love she was so sorely lacking in the early stages of her life. She looks so happy. What a difference from when she was first accepted into rescue and went to Judy�s home to begin her new lease on life.